India’s Nalanda University opens again after 800 years. One of India’s most famous universities from antiquity, Nalanda University, reopened this Monday after a hiatus of over 800 years. Both the ruins of the old Nalanda University and the new Nalanda University are located near Rajgir in India’s Bihar state, an area that has a high concentration of ancient religious and historical sites, including Bodh Gaya, the site where the Buddha gained Enlightenment. This area was the core of ancient Magadha, a kingdom in ancient India that was known for its intellectual and political ferment. In addition to being a center of Hinduism, it was in Magadha that Buddhism and Jainism arose. India’s first empire, the Mauryan Empire, arose from Magadha; its most famous emperor, Ashoka, was highly influential in patronizing and spreading Buddhism throughout Asia. In fact, the present day state of Bihar’s name is derived from the word vihara, the term for a Buddhist monastery, which is testament to the large number of monasteries that dotted the region that became Bihar. Nalanda University arose from this context, the same way the schools of Athens and Alexandria arose from the intellectual fervor of the Hellenistic Mediterranean. 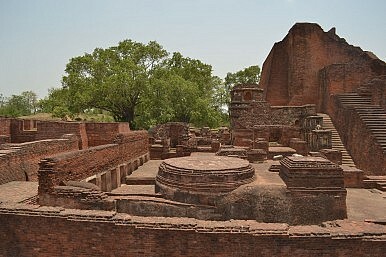 There were many other ancient Indian universities as well, including Takshashila (Taxila) in modern day Pakistan, but Nalanda University stood out due to its size and cosmopolitanism. Built during the Gupta Empire – the state associated with India’s golden age of culture and science – the original Nalanda University existed from between 413 C.E. and 1193 C.E. Although it was founded as a center for Buddhist philosophical study, it eventually became an institution for the study of various subjects, including secular ones, similar to the manner in which many medieval Christian universities evolved from being scholastic centers to more general institutions. Nalanda University was especially famous for the study of mathematics and medicine. Nalanda University’s Buddhist origins and strong Buddhist curriculum meant that the university attracted a large number of students from outside of India, giving it a cosmopolitan air and enabling cross-cultural intellectual discourse. According to the website of the new Nalanda University, “the profound knowledge of Nalanda teachers attracted scholars from places as distant as China, Korea, Japan, Tibet, Mongolia, Turkey, Sri Lanka, and Southeast Asia.” At its height, the university had 10,000 students and 2,000 teachers, while its libraries contained hundreds of thousands of books. Unfortunately, however, the original Nalanda University was destroyed in 1193 C.E. A coalition of Hindu rulers upriver from Nalanda were defeated near Delhi by the Muslim Afghan marauder Muhammad of Ghor at the Second Battle of Tarain in 1192 C.E. This laid the entire Ganges River Valley of North India bare before the invaders. Within a year, a Turkic general, Bakhtiyar Khilji sacked the undefended Nalanda University, which had no fortifications as it was not a strategically relevant military site. A contemporary Persian chronicle reported that thousands of monks were burned alive and thousands more beheaded as Khilji tried his best to uproot Buddhism. The burning of the library continued for several months and “smoke from the burning manuscripts hung for days like a dark pall over the low hills.” The last head of Nalanda University fled to Tibet. Due to its famous history, the university has come under the patronage of famous figures such as Nobel Prize Laureate Amartya Sen, who is the chairman of the governing body of the university. 15 Asian countries have agreed to provide up to $500 million in funds for the university. However, these funds have not been forthcoming. Additionally, a lack of funding in India and a slow bureaucracy mean that Nalanda University is sadly incomplete at the time of its opening. There are currently only 15 students in the opening class, of whom only two are not from India. Classes are being held in makeshift circumstances as work has not yet begun on the 455-acre campus, due to the process of getting municipal clearances. A formal inauguration is slated to occur in mid-September. The hope is that as word gets around, the student body will expand and more money will roll in. Such a great idea that has the backing of famous figures deserves to do much better than it is currently doing. Hopefully, the new Indian government will be able to speed things along. If Nalanda University meets its planned goals, it could represent a giant leap forward for India’s higher education. The Alliance of Indian Kings: Can a Coalition Defeat Modi’s BJP in the 2019 Elections? A few regional parties could potentially tip the scales in India’s upcoming elections.